Spice-scented blooms with ruffled and toothed/fringed petals in shades and combinations of pink, red and white are the trademarks of these low-growing cottage garden favorites. 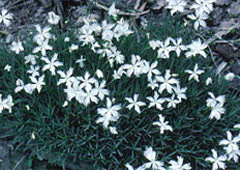 Most are varieties of Dianthus plumarius, and need full sun, good drainage and slightly alkaline soil. Depends on variety. Many are hardy only to Zone 5. A few are hardy to Zone 3. Blooms may be single color, or combinations of red, white or pink shades. fragrant - Flowers usually have spicy scents, often resembling cloves or cinnamon. cut flowers - Some varieties make good cut flowers. Propagate by seed, cuttings, division or separation - Divide every 2 to 3 years. Self-seeds if not deadheaded. Seed germinates rapidly under warm, humid conditions. Make cuttings of side shoots after flowering. Cut plants back by half after flowering. Allow seeds to develop and set before cutting if self-seeding is desired. Leave evergreen foliage for fall and winter interest. Protect from overly moist conditions, as these easily cause rot. Divide in spring or fall every 2 or 3 years. Antique varieties: In cultivation before 1920. Time-tested and often strongly fragrant. Growth tends to be open and loose. �Bat�s Double Red� bears double, rich red blooms with showy toothed margins. Dark blue-green leaves. Zones 5 to 8. �Beatrix� bears double, cinnamon-scented magenta-pink blooms are arranged in clusters. Dark green leaves. Zones 5 to 9. �Brympton Red� bears bright red blooms with thick dark red stripes. Zones 5 to 9. �Dad�s Favorite� bears showy semi-double blooms that are white with rosy-red margins and reddish purple centers. Zones 4 to 9. �Earl of Essex� bears double rose-colored blooms with darker centers. Zones 5 to 10. �Fair Folly� (�Constance Finnis�) bears white blooms with reddish-pink markings and margins. Zones 5 to 9. �Her Majesty� bears double pure white blooms with strong scent and showy fringe. Zones 5 to 9. �Inchmery� bears semi-double pale pink blooms. Zones 4 to 9. �Lady Granville� bears semi-double white blooms with dark red margins and centers. Strongly scented. Zones 4 to 9. �Mrs. 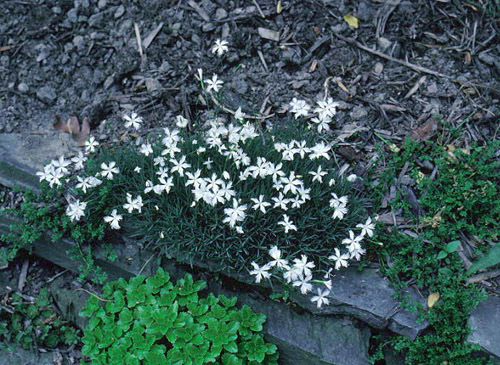 Sinkins� bears double, deeply fringed white blooms with strong fragrance. Zones 5 to 9. �Musgrave�s Pink� (�Charles Musgrave�) bears fringed white blooms with light green centers. Clove fragrance. Zones 4 to 8. �Queen of Sheba� bears white blooms with showy teeth and magenta markings. Strong clove fragrance. Zones 5 to 8. �Rose de Mai� bears pale pink blooms with darker markings. Very fragrant. Zones 4 to 9. �Ursula Le Grove� bears white blooms with dark red centers and margins. Strong fragrance and long bloom period. Zones 4 to 9. Modern varieties: These feature longer bloom seasons, dense, compact growth habits and unique new color combinations. �Agatha� bears fragrant, fringed, double blooms that are pale purple with dark violet eyes. Zones 4 to 10. �Alice� bears semi-double blooms that are white with dark red centers and margins. Clove scented. Zones 5 to 9. �Aqua� bears double pure white blooms with strong clove fragrance. Zones 5 to 9. �Becky Robinson� bears double, bright pink petals that have dark red margins and markings near their base. Clove fragrance. Zones 5 to 9. �Berry Burst� bears rosy-violet toothed and fragrant blooms with darker rose-violet markings. Zones 4 to 9. �Christopher� bears double deep-salmon-pink blooms with strong clove fragrance. Long lasting flowers. Zones 5 to 9. �Coronation Ruby� bears double, bright-pink blooms with rich red markings and margins. Strong clove fragrance. Zones 5 to 9. �Danielle Marie� (�Danielle�) bears double, toothed, dark salmon/coral, long-stemmed blooms with strong clove scent on dense plants with gray leaves. Zones 4 to 10. �Desmond� bears double, deep red blooms that are good for cutting. Zones 5 to 9. �Doris� bears semi-double salmon blooms with dark red centers. Zones 5 to 10. �Evangeline� bears double, bright pink blooms with strong fragrance. Zones 4 to 8. �Gran�s Farourite� bears semi-double white blooms with deep rosy-purple centers and margins. Zones 5 to 10. �Houndspool Cheryl� bears double, deep maroon-red blooms. Zones 4 to 10. �Ian� bears double, dark red blooms with strong fragrance. Zones 5 to 9. �Itsaul White� bears white blooms have vanilla fragrance. Tolerates heat well. Zones 4 to 8. �Laced Monarch� bears double, deep magenta-pink blooms with deep red centers and margins. Zones 5 to 9. �London Delight� bears semi-double blooms are light pink with dark red margins and centers. Clove fragrance. Zones 5 to 9. �Loveliness� (�Rainbow Loveliness Strain�) bears blooms that have showy fringe and strong fragrance. Flowers are variety of combinations of red, pink and white, with showy markings and margins. Plants are short-lived. Zones 3 to 9. �Margaret Curtis� bears white blooms with very dark red centers. Fragrant. Zones 4 to 10. �Monica Wyatt� bears pale purple-pink blooms with dark pink centers and clove scent. Zones 5 to 10. �Peppermint Patty� bears deeply toothed, light pink blooms with spice scent. Zones 3 to 8. �Pink Princess� bears strongly scented salmon blooms. Prolific bloomer. Zones 4 to 9. �Prairie Pink� bears fragrant, double, dark rosy pink blooms with showy teeth. Long bloom period. Zones 4 to 9. �Raspberry Tart� bears spice-scented rosy red semi-double blooms with dark red centers. Zones 3 to 8. �Robespierre� bears salmon double blooms with red striping. Zones 5 to 9. �Salmon Unique� bears double, coral-pink blooms. Zones 5 to 9. �Valda Wyatt� bears double, rosy-pink blooms darken in color near the center. Clove-scented. Zones 5 to 10.